Student Athlete, the latest HBO Sports documentary by executive producer and professional basketball player LeBron James, paints the lives of four American college athletes who hope to make it big in basketball. It becomes increasingly apparent during the programme that the students’ ability to achieve their athletic goals weakens over time as only a slim fraction continue on to the National Basketball Association, while the rest are left to scramble with what is left of their education. The documentary reported that 303 out of more than 91,000 college athletes are drafted to play professionally in the US in 2017. This means a student athlete has a 0.3 per cent chance of pursuing a career in the multi-billion-dollar industry of American college sports. In Singapore, where sports is not as lucrative, opportunities for student athletes to pursue full-time sports careers are even rarer. Although Singapore has a smaller talent pool, and therefore more chances for athletes to play professionally, people are generally reluctant to make a career out of sports. This is because most athletes in Singapore are not paid -- this applies to all except sports like badminton, golf and table tennis, according to AsiaOne, where athletes can supplement an income from competition winnings -- and have to occasionally fork out their own money to regularly train and enter competitions, and this often relegates sports to a side hobby. For student athletes at the varsity level, pursuing their sport means they have to balance their training schedules with their school commitments. Universities, as well as the government, should therefore consider implementing more measures to support student athletes who are trying to carve out a sports career for themselves. It is not easy for a student athlete to juggle school and training sessions. I remember the sense of satisfaction last August I felt when I finally made it to the national floorball training squad after many years. But achievement comes with a price. During the academic semester, my teammates and I train four times a week to prepare for the upcoming World Floorball Championship Qualifiers. Besides these sessions, I train twice a week with Titans, my floorball club outside of school, and play in matches on Sundays. Factor in my varsity-level trainings, which peak in the months leading up to the Singapore University Games and the Institute-Varsity-Polytechnic Games, and my schedule becomes too packed for other activities. 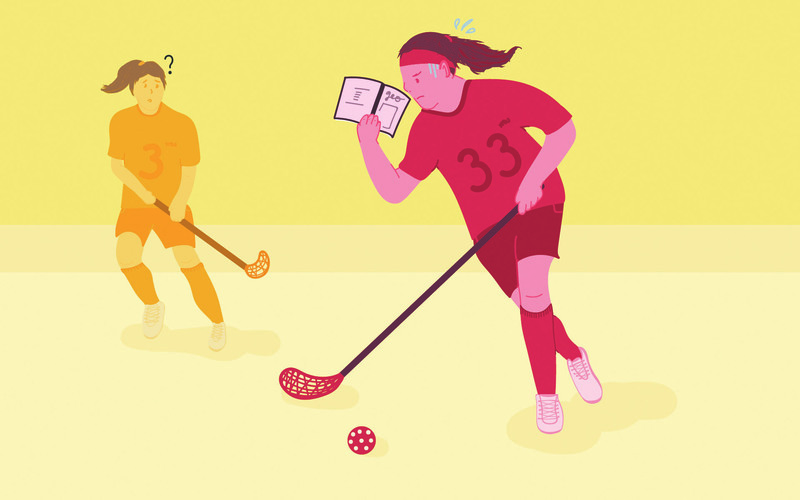 During these months, my schedule is a blur of scurrying from lecture theatres to floorball courts, and sneaking in meals in between classes and training sessions. Since a large part of my day is spent on the training field, I have to figure out how to complete my assignments while getting sufficient sleep. This lifestyle is extremely taxing on the mind and body. Not surprisingly, my grades have slipped from missing classes and assignment deadlines. On court, I have also found myself making costly mistakes during floorball games due to my lack of sleep and therefore, concentration. My mother has advised me to be a “student first, then athlete”. However, I prefer to see myself as an individual with two hats on. Some students, however, have chosen to focus on their books. An example is hockey player Sean See, who was the Straits Times’ Young Star of the Month in October last year. See quit playing hockey competitively while at the prime of his sporting career, in order to focus on his studies in junior college. Meanwhile, other students have prioritised their sport over academics. First-year Sports Science and Management student Lim Jian Hong applied for a semester-long Leave of Absence to prepare for last December’s World Floorball Championships held in the Czech Republic. The men’s floorball national team had planned a 18-day training camp in Finland, which coincided with the 22-year-old’s final examinations. With help from NTU, Lim’s application for leave was approved and he will start school this year. Singapore can take more steps to develop budding athletes from a young age. This can be done by scouting for talents from the Singapore National School Games (NSG) and encouraging them to apply to sports academies or sign up for structured training programmes that focus on strength conditioning or skill-work, coached by established athletes. The NSG sees over 58,000 participants compete across 29 different sports from the primary to tertiary school levels annually, and is a large talent pool that is worth investing in for sports development. Students will be encouraged to continue pursuing their sport over the years despite having a heavy workload at school with more support structures in place like the latest two-tiered competition system enforced by the Ministry of Education to emphasize on competitive exposure that started in January last year. This will dissect the system and advance the level of sports excellence from a young age. This has numerous benefits for Singapore, as its sports industry can expect more regional and international success if the quality of its sporting talent improves, and athletes can contribute to its economy through the National Olympic Council’s Multi-Million Dollar Award Programme, that requires athletes to plough back at least 20 per cent of winnings to their respective sports associations. In the English Premier League, many world-class players make their mark between the ages of 17 to 20. For example, 19-year-old Kylian Mbappe, who plays football for France and Paris Saint-Germain, earns about S$27.3 million a year. Singapore has only bagged a total of five Olympic medals to date, and four of these medals were won by foreign-born athletes. The one won by a local athlete was from the 2016 Rio Olympics, in which 23-year-old swimmer Joseph Schooling won Singapore’s first Olympic gold medal. However, Schooling’s success is mostly attributed to the intensive training he received after he moved to the US when he was 14 years old. Schooling, who trained in various states like Florida and Texas, went on to hold a national, Asian and Olympic record in the 100-metre butterfly event. Athletes, and student athletes in particular, should not have to venture overseas to find sporting success. Student athletes who might have similar talents to Schooling and Mbappe could be sitting in a classroom, waiting to burst into the sports arena. But if they wait until they graduate in order to continue their sports careers, it might be too late.